From college mixtape sensation, Quin XCII is now a full-blown rap artist who be headlining a massive tour of 2019. As he dropped his sophomore album, From Michigan With Love this year, he hit the ground running at the live concert circuit with a 30-city tour of North America. The Fillmore Auditorium is one of his destinations where an enormous crowd is expected to gather at his live show on Saturday, 23rd March 2019. For an artist like Quinn XCII who has achieved both critical acclaim and millions of online streams, he is definitely a crowd drawer. Don't wait 'til the last minute, as tickets are moving quickly. Get your tickets now! From Michigan With Love, is an album title that aptly signifies where his music love affair started. While growing up in his hometown in Detroit, Michigan, Quinn XCII grew up to the music of Motown history. Hence, his rap style is an amalgam of hip-hop, pop, reggae, rock, electronic and soul. As a student at Michigan State University, he dabbled on songwriting which led him to cross paths with Ayokay. The two collaborated on Quinn XCII's debut mixtape Shlup, consisted of covers plus the original production "Violins." The song created a buzz among online music fans. With the blogosphere creative waves for his music, major label caught on and released his debut EP, Change of Scenery, with the single "Stung" peaking at number 1 among online bloggers. This gave Quinn XCII a major breakthrough into the mainstream audience. With the release of another single "Kings of Summer," Quinn XCII set a foothold as a stellar force in the realm of rap and hip-hop music. With excitement and anticipation brewing not only among fans, Quinn XCII is also equally pumped-up for this tour. “So much has happened in the last year while writing this project, both in my personal life and in my career," .I’ve grown a lot as a person and artist, I’ve gotten to work with a lot of new people, I’ve toured the world and gotten to meet so many amazing fans who have been supporting the music for years. With all of that comes a much better understanding of the music I want to make and the impact I want it to have." 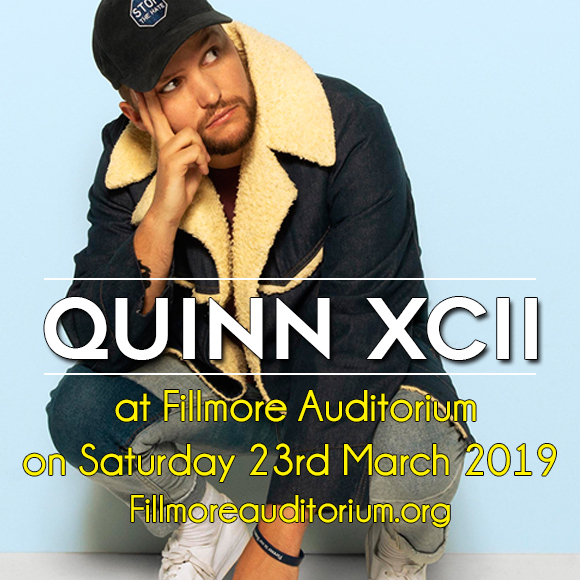 Quinn XCII at Fillmore Auditorium on Saturday 23rd March 2019. Save the date and get your tickets now!